Southern Fried L'Attitudes: More Weight Loss and Learning to do Power Hours! Good morning! Well, I'm posting pics of flowers this morning since Granny loves them so. Hospice there with her yesterday. Family going through pictures and funeral prep. Gathering with the family tonight over dinner to go through more pics. I have a job fair today. So it will be a busy one. We will see what the day brings. Our Granny (George's Mom) she is a fighter. I weighed in this morning. I'm down another 5 lbs. So a total of 23 all together! A great cleanse day yesterday. I had to run some company errands as well as personal errands around mid-day. The day went fast. I had an e-shot in the afternoon and that made a big difference - at 9:30 last night I was still going strong. The e-shot is about the strength of a cup of coffee - it's not like other energy drinks. It has adaptogens in it to aid with stress. And so at 9:30 on a cleanse night of all things I was still going strong. My eyes were sleepy but my brain was still moving. I still slept good when I went to bed though. I had power hour last night on Instagram. Sharing and connecting. I've decided that this is quite fun actually. And I'm learning and seeing some success in the right direction which is encouraging. Baby steps but leaps of faith. And God led. Once again let me say - last night was highly encouraging to me! Truly it was. I enjoyed connecting with so many. This is a ceiling break through folks. I'm getting back to me and over a hump I think. So I'm off to get some things done before I head out this morning. I am excited that the peach mango shake is back as a permanent flavor! Gonna have to order it! ;-) Woo Hoo! Haven't decided on my flavor this morning, coming off of the cleanse. Perhaps I'll do vanilla with frozen peaches thrown in. The job fair is from 11 to 2 so right during lunch time. I'm taking a meal replacement bar so I'll have something at least. I don't think I can wait til 2 to eat. We have to be there at 9:30 to set up and I guess will leave around 2:30. In the mean time emails and to do's will stack up through the day that will have no choice but to wait til we are back in full service tomorrow. Who knows when the call will come on Granny. Well, ya'll have a good day. More later. 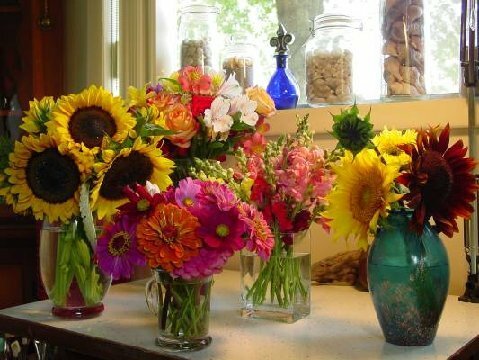 Flowers do bring a lot of cheer into our lives. None of knows what each day may bring our way. We just have to make the best of what will comes. Taking time to be prepared as you gather with family is good. It'll make it easier later on. Hope your job fair is a good one with lots of new hires coming your way. Sounds like extra work, but worth it. hope you had a good job fair day. glad to hear you had a good night.